Here’s a real world situation where turning on DAOS resulted in time and disk savings for backups. After we enabled DAOS on the primary mail server at my client, they calculated how it impacted their backup procedures. Weekend full backups went from 137 GB to 98 GB. Time went from 289 minutes to 218 minutes. The savings here is mostly from eliminating duplicate attachments. Average daily differential backups went from about 105 GB to 35 GB. Time went from 93 minutes to 45 minutes. The savings here is mostly from not backing up attachments that didn’t change. We anticipate that the total backups for the week (1 full and 5 differentials) should go from 664 GB to 275 GB. This should save about 1.2 TB on the larger backup NAS. The DAOS store is 35 GB in size and contains 60,763 files. If this is a result for a 250-people organization, imagine what DAOS can do on a larger scale. IamLUG is approaching fast and it is time to get your marketing materials in order. 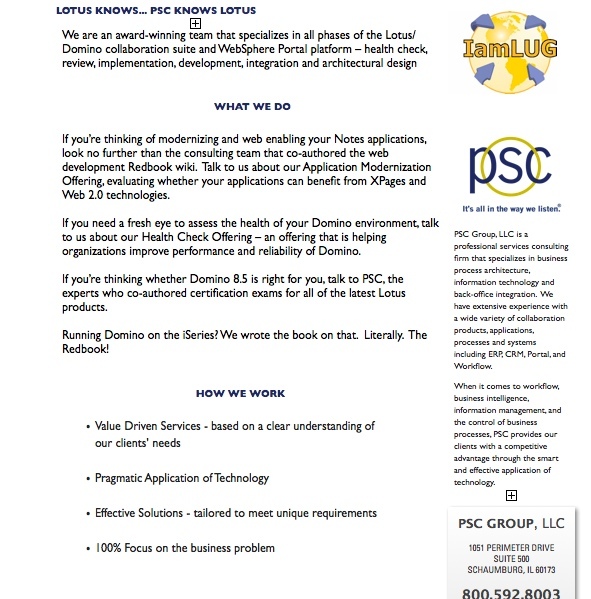 I just finished updating PSC flyers with IamLUG logos. Next step — get them printed. Domino 64-bit — is it worth it? At least when it comes to 8.5.1, is it worth all the trouble? Everyone is clearly excited about performance improvements that the 64-bit version offers. The native support of the 64-bit architecture is a big plus on its own, you must have that in order to be counted a modern piece of software. Many kudos to the Lotus server team for making it happen. But what about the other products and the other pieces of the server? Not everything — native IBM and 3rd party — works with 64-bit. For example, SameTime, still a 32-bit product, does not recognize that Domino is even installed, if trying to run on top of the 64-bit version. The lack of ODBC support is a huge problem. Luckily, it is soon to be solved by the 8.5.2 release. As the Lotus team is fighting to revitalize Lotus Domino as a valid application development platform, shipping a product without the ODBC support was a mistake. There should’ve been a big huge disclaimer at the beginning of the installation routine: if you use ODBC, don’t install this version. I hope that the 8.5.2 release will address all these issues. Don’t worry about Chinese. It’s all pretty self explanatory. This year I started a new system to try to be more organized. I stumbled onto it by accident, this is not something I read about somewhere. This is something that just sort of felt right and has been working for me. It started with me attending one IBM event and, instead of the usual notepad, receiving a simple Staples® Compositions notebook. You can pick up a pack of 2 for $5.29. I didn’t take a lot of notes during the event, so the notebook was pretty much empty. Yet somehow it just felt right (I liked the size and the feel of it: 100 empty pages waiting to be filled) so, instead of discarding, I kept it and started using it. I used it for 2 purposes. First of all, to take notes. I start a dedicated page for every meeting. Notes from a meeting may take more than 1 page, of course, but starting every meeting on a new page made it easier to find later. I put the client’s name or the meeting title or something at the top of the page and the date and use a highlighter or some other way to make it stand out, so that it is easier to find in the future. Second, I started keeping detailed to do lists. These are not necessarily specific to a day, just a long running to do list. I number each item and start again when I get to 100. I add items to the list all the time: as new things arise, scheduled meetings, phone calls I need to make. I even add items that I already did even if they were not on the list. This way I have a better picture of what my day was like. As each thing gets done, I cross it out. Periodically, I go back a couple pages or so to see if anything is left open. A running list lets me catch up, in case I forgot something from a day or two ago.Because the notebook has kind of a hard cover and its pages are not easily removable (unlike a standard notepad), everything — notes, names, phone numbers, to do items — I wrote down stays there. After 6 months, I finally finished my first notebook. And it looks a little tattered from all the use. This worked so well for me, that I decided to upgrade to a better notebook. This one has a better cover and better quality paper (works better with my fountain pen) and it doesn’t make me look like a middle school kid.